1HD.BIZ - Really The Best Deals Around: Race News: 2017 24 Hours of Le Mans - Porsche 919 Hybrid WINS!! 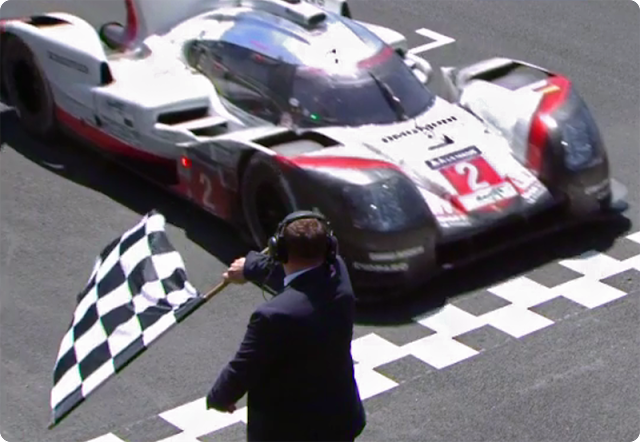 Race News: 2017 24 Hours of Le Mans - Porsche 919 Hybrid WINS!! FINAL UPDATE: Race is officially over! The #2 Porsche is the overall winner of the 2017 Le Mans 24 Hours. Congratulations to the team... fantastic job. Update 2: The #2 Porsche (LM P1) has done it, and is now in the lead, ovetaking car #38 (LM P2). Only 24 minutes left till the end of the race. Update 1: The #1 Porsche is also out of the race. So now the #38 car of Jackie Chan Racing (LM P2 category) is leading the race! What a turn of events. Looks like the leading #7 Toyota followed by the #9 Toyota suffered failures during the night, and are out of the race. Which means, the #1 Porsche 919 Hybrid (LM P1 category) is currently the overall leader, with roughly 4H:00m left to the end of the race. Video clips of interesting moments in the race on Facebook. Watch LIVE stream in Dutch.